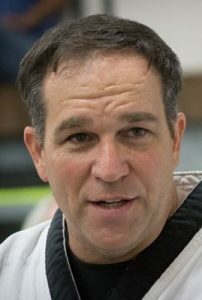 Thomas Gordon is school owner and Chief instructor at Gordon Martial Arts. He is also the host of the international Korean Martial Art Festival and Gulf Coast Martial Art Championships both which are located in Crestview, Florida. Thomas got his first taste of martial arts at a small martial art school at the corner of Highway 85 & 90 next door to Teal & Waters. He was in elementary school at the time and martial arts weren’t geared towards children as they are today. Wasn’t long before the school closed and he got another shoot at martial arts as a young adult when another martial art school opened near his home. 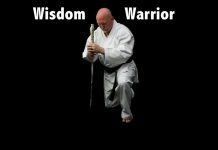 That school was part of a closed martial art organization that eventually led to him partnering up with Mr Gregory Bledsoe in opening a school in a neighboring community. After five years of running the school and ten years of traveling throughout the United States to compete, Thomas wanted to get more in line with the original Taekwondo system and open a school in his hometown. 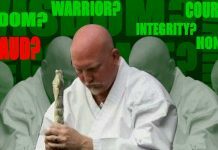 In 2003 Thomas Gordon was able to open Gordon Martial Arts and align himself with two highly respected grandmasters of GM Hwang, KS (K-9-1) and GM Rudy Timmerman. Since then he has trained & taught in Canada, Korea, Australia, Scotland, England, Netherlands, Mexico, France, and all over the United States. While teaching most every walk of life and profession, being in an area heavy with military, Thomas has trained many levels of military personal including Special Operations, Special Forces, and most levels of law enforcement. He has been published, featured, and covered in 100’s of magazines and newspapers. (1) Watching both his daughters test for Black Belt with grandmasters on the panel. 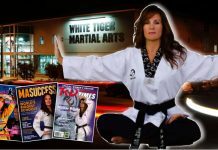 (2) Being featured six times on the cover of Taekwondo Times (TKDT) in July 2010 as one of the ten “Movers & Shakers” in the Korean Martial Arts, featured solo on the November 2011 TKDT cover “Football, The Martial Artist Way” due to him playing Semi-Pro Football into his 40’s, January 2013 with Grand Master Hwang, March 2013 with Korean Martial Art Festival being listed as “Must Do Event of the Year,” January 2014 cover with MMA/UFC legend Dan “The Beast” Severn, and a special edition for March 2014. (3) Being able to test for sixth degree in Taekwon-Do in front of GM Hwang and GM Timmerman. (4) And being able to train and teach martial arts while traveling to see many other countries. Chief Master Gordon is currently a seventh degree in Taekwon-Do, sixth degree in Hapkido, and second degree in Combat JuJitsu. Outside of the “martial art world,” Thomas Gordon played Offensive Tackle and Center for the Crestview Thunderbirds, an adult semi-pro football team playing his last season in 2012. Thomas also owns & operates an air conditioning business that was started by his parents in 1979. Over the years he has served on the Board of Adjustments for City of Crestview, the Board of Directors for the local YMCA, Building & Grounds Committee at his church, Green Committee for Building Industry Association, Crestview City Councilman, board member of Crestview Community Redevelopment Agency, and Okaloosa RESTORE Advisory Committee (BP Oil Spill).